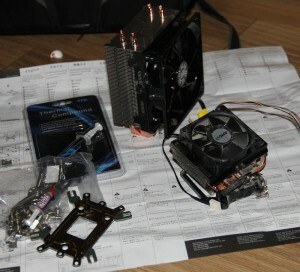 I ordered a CoolerMaster Hyper 212 Evo from Amazon for £26.50 to keep my machine a little cooler than the stock heat sink. The two heat sinks are shown below. The CoolerMaster is much bigger and could be a struggle to get in to most cases but I am very happy with the results. It keeps my processor cooler and is a little quieter than the stock one. The images below show the temperature of the CPU on first boot and then after 10 minutes playing 0 A.D. So around 40°C and up to almost 100°C. After replacing the stock heat sink with the Hyper 212 Evo the temperatures were as below. A much more respectable 31/46°C rising to 36/60°C after 10 minutes on 0 A.D.